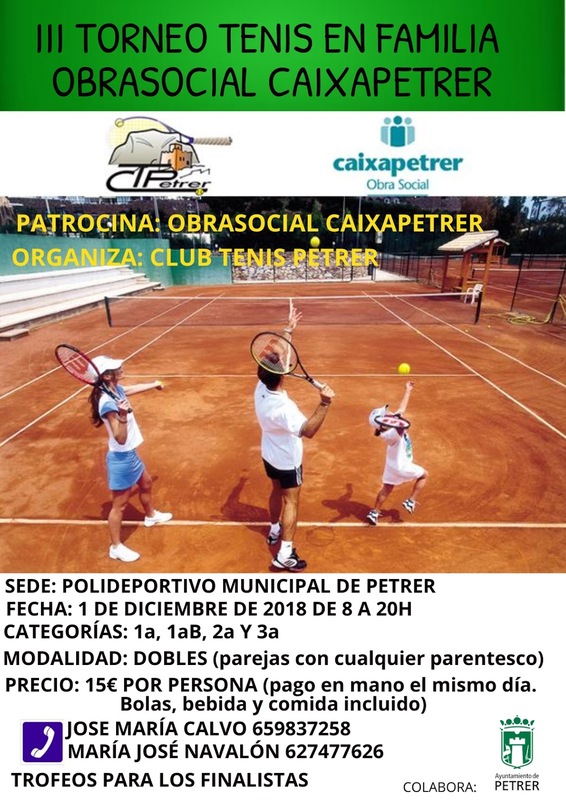 YA ESTA EN MARCHA, EL PRÓXIMO TORNEO SOCIAL III TENIS EN FAMILIA OBRA SOCIAL CAIXAPETRER. DESDE AQUÍ AGRADECER NUEVAMENTE A LA OBRA SOCIAL SU COLABORACIÓN CON NOSOTROS, AL IGUAL QUE AL AYUNTAMIENTO POR LA CESIÓN DE LA INSTALACIÓN. OS ESPERAMOS PARA DISFRUTAR NUEVAMENTE DE ESTE NUESTRO GRAN DEPORTE EN FAMILIA.